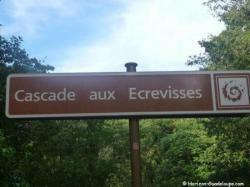 On the road Crossing: The "Cascade aux Ecrevisses", the most visited for easier access. Parking close to this path can park the car easily. This is incontounable place for organized groups. A nice place in which to spend a few moments to enjoy the freshness. Hardly 10 minutes walk to get to the waterfall through a nice path laid out. Access possible for disabled people. We arrive on a small platform from which one can see the waterfall without getting wet. If you feel like it, you can even swim ... One can also get off the platform, climb over the rocks (slippery) to meet on the banks of the river where the waterfall empties. The picnic area of the "cascade aux écrevisses"
When you are in the parking lot of the cascade with crayfish, cross the road, to get in front at the picnic area of ​​the "cascade aux écrevisses". Sorry if translation is not perfect.